The town square: safer and quicker than traffic lights. No, really. A: Of course you are! But have you noticed that everyone else drives like a moron? Q: Have you ever noticed that pedestrians and cyclists are always in the way when you're driving your car? A: Of course you have! But have you also noticed how drivers suddenly turn into idiots when you walk or ride your bike? The good news is that, according to the book, many of the illegal or dangerous things we do when we drive aren't our fault; we're often "lured" to drive based on the design of the road and other external factors: we're simply acting as any rational person would, given the situation. Try explaining that to a cop to get out of a ticket. "But officer, it's the design of the freeway that lured me into having a false sense of safety!" It's sobering to consider that when we drive, much of the time we're depending on nothing more than "human nature" to keep us safe. What's more, Vanderbilt says that we're almost never right about what's "safe" and what's "dangerous." Q: What's more dangerous: driving on a clear highway going in a straight direction with guard rails and speed-limit signs, or driving up a winding mountain road in the rain with no guard rails or speed-limit signs? A: When we feel that something is dangerous, we drive more safely. When we feel that something is safe, we drive more dangerously. So, paradoxically, "dangerous is safe." As North Americans, we think that "roundabouts" are more dangerous than traffic lights. However, Vanderbilt points out that roundabouts require that you pay attention to what's going on around you. A traffic light causes us to pay attention to the traffic light. "We have a strange, almost fetishistic belief in the power of signals," he says. Today, I noticed that I was driving a slow 40 kph through Corydon village. What's the actual speed limit on Corydon? 50? 60? I can't remember ever seeing a speed limit, but the narrow road with cars parked on both sides, and plenty of crosswalks and pedestrians who use them, make it futile and dangerous to go faster. Conversely, I know that the speed limit on Grant Ave. is 50 kph in some places, but it feels perfectly safe to go 70 kph. The cops must know this, because there are lots of photo radar stations on Grant, but none on Corydon (near the restaurant district, anyway). After reading Vanderbilt's book, a reasonable solution would be to make Grant Ave. feel less safe to go fast. But there's no photo radar money in that, is there? Ample parking is a good thing, right? When I tell Winnipeggers that I paid $200 US for three days' parking in downtown Chicago, they look at me like I'm a mental case. Maybe I am, but Winnipeggers are famous for complaining about lack of free parking - and our downtown has more parking than any major North American city. "The new Wal-Mart is built and, lo and behold, it attracts lots of cars. Planners seem to ignore the fact that they are helping to dictate demand by providing supply. There are lots of cars in lots because parking is free. "Parking lots are not only the handmaidens of traffic congestion, they're temperature-boosting heat islands, as well as festering urban and suburban floodplains whose rapid storm-water runoff dumps motor oil and carcinogenic toxins into the overwhelmed sewer systems." Q: Are you an early or late merger? A: It's better not to say in mixed company. One of the most contentious traffic issues is the early vs. late merge. Joseph Rose of the Oregonian calls it "one of the great philosophical debates of modern commuting." "Driving home from downtown Portland, I always exit Interstate 84. Just before the Shell station, a yellow sign informs drivers in the left lane that they need to merge right. 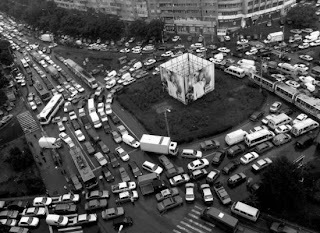 "The right lane is often jammed. Still, as soon as she sees the sign, Heidi flips on the turn signal and goes for the first opening. The people in the right lane, she says, were there first. "Me? I say the merge lanes on city streets and highways are there for a reason. Use 'em or lose 'em. Merging early, I argue, creates bottlenecks and angers the cars behind you. People in the other lane shoot me angry looks as I drive toward the end of the merge lane." Bring this up with anyone and prepare for a fight. I was shocked to recently find out that my father agrees with the late-merge theory. "Every inch of the road should be used for the most efficiency," he says. I'm an early merger. I treat late mergers with the same disdain as those who cut in line at the movie theatre or - even worse - pass money to their friends in line at Tim Hortons. "You're one of the the ***holes that causes the traffic jam every single day because you people fail to merge properly. I hope you die." So, who's right? Vanderbilt stirs the pot by not only suggesting that late mergers actually help traffic flow, but that he himself has now joined their ranks. Boo. I'm still not going to let you late mergers into my lane! Traffic is as well researched as any book I've read, and also a lot of fun. One of my favorite chapters involves Vanderbilt's visit to the LA traffic-control department, where he discovers that the most "found" item on LA freeways is: a ladder. So, if you've ever felt a little leery about that bouncing ladder in the back of the truck driving in front of you: good for you. Vanderbilt also learns how the department ensures that thousands of cars full of VIPs arrive at the Oscars year after year with minimum hassle (I won't give it away here, but it's fascinating) and observes how it somehow manages to control and even predict the day-to-day mayhem on LA highways. Sample traffic report: "Man urinating on highway. No sign of veh." Traffic is full of memorable facts and anecdotes to discuss at your next party. Digging deep into "the psychology of traffic," it challenges many of our widely held assumptions about driving and should be required reading for anyone who's learning to drive, and the rest of us, who already think we know how. Wow! Great post! I want to read this book now!